Since its start in 1962, Lakewood Auto Body has been providing outstanding truck and car painting services in DuPont, WA. We are a family run, locally owned and operated business. Our services include custom auto body painting, auto body repair, and mechanical repairs. We are especially noted for our car and truck painting Volvo. We have full faith in the capabilities of our ASE and I-Car certified paint techs. With 27 years of combined experience, they are accomplished in handling all Volvo makes and models. The car painting Volvo C30 performed by them is unmatched by any other auto body paint shop in the community. Technical superiority, excellent industrial finish, and impeccable customer service make your truck painting Volvo VN630 experience at Lakewood Auto Body an extremely satisfying experience. The paint of your Volvo is continually exposed to and damaged by the ever-changing weather conditions. It may also be damaged due to an accident, whether it is a brushing against another vehicle or a head-on collision. The damaged paint spoils the appearance of your Volvo and besides ruining your mood it also lowers the resale value of the car/truck. Car and truck owners in DuPont, WA have a reliable and efficient truck and car painting Volvo specialist in Lakewood Auto Body. Our highly skilled paint techs promise a sparkling original look restored to your Volvo cars and trucks. Mechanical auto repairs including engine, exhaust, suspension, AC systems, etc. Why Choose Lakewood Autobody in DuPont, WA? Car painting Volvo S80offered by Lakewood Auto Body is the fastest and most professional in DuPont, WA. 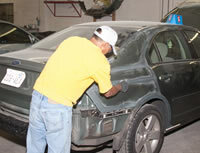 Company with 50 years of experience in auto body paint industry. Complimentary detailing with all repair and paint jobs. Useful guidance to customers to help their vehicle’s paint last really long. Lifetime warranty on body paint services. Skilful, trained, hard-working, friendly and sincere technicians.